This is Rig, the latest fighter to enter the Dead or Alive 5 fray. 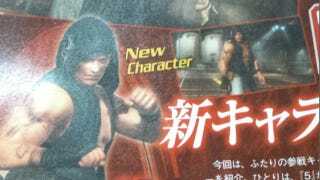 Not much is known about the new character: He's from Canada and his fighting style is taekwondo. Voice actor Hiroki Tochi, who has done lots of work with game studio Tri-Ace, will bring Rig to life. The first images of Rig appeared Japanese game magazine Famitsu. The publication also showed off Dead or Alive 5's photo mode, which allows players to zoom and change angles while photographing fights. Steven Spielberg sorry he made all those changes to E.T.